1984: Why is Government mum over missing Archives & Artefacts? and demanded the resignation of the Defence Minister. Following questions emerge out of this controversy. 1. Did the Army in 1984 collect and take away the archives and artefacts? 2. Did it return any or all of these documents and articles to SGPC? 3. If SGPC did not receive these documents and articles, who has their custody? pertinent to know the facts. Toshakhana some months ago, but did not know who looks after the treasure and how? fresh in my eyes till date. themselves nor allowed anyone to come near. On return to Div HQs I gave the entire report to my General. He appreciated my work. formality, it was locked and stamped. This way the Army was saved from a serious blame. 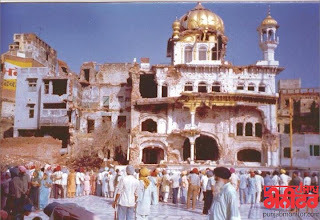 administration during the Operation Blue Star. and CBI. These were also duly signed by representatives of SGPC. without any interference from SGPC, Army or CBI.